Having a trouble waking up or falling asleep at night?Late for school or work? to simulate sunrise 30min before the alarm, help you wake up gradually with natural light and natural sounds, start a day with relaxing morning. This sunlight alarm clock is powered by USB or adapter. The battery inside the clock only has memory function. ⏰☀️☀️Sunrise & Sunset Simulation: The warm light will get bright from 0%-100% to simulate sunrise 30min before your wake up time. Revitalize your day right at the beginning. Also, gentle sunset gradually dims down within 15/30/60 minutes to relax your mind for a sweet dreamland. ⏰6 Natural Sounds With FM Radio: Never afradi of getting up late. Our sunrise alarm clock can bring you out of deep sleep by 6 various nature sounds ( Morning, Birds singing, Ocean Waves, Violin, Forest, Beeping ) and your favorite FM radio, which gives you a relaxing waking-up experience. 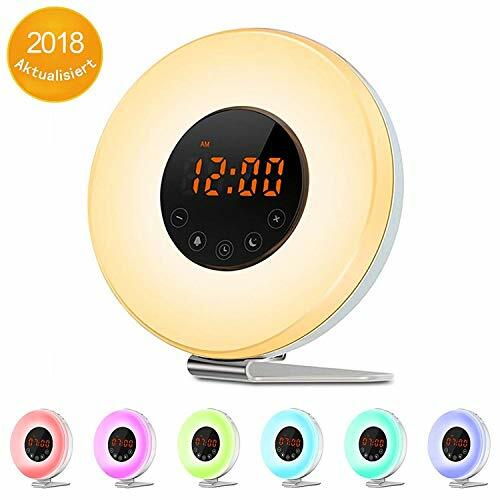 ⏰7 Colors Night Light✨✨: You can easily change 7 colorful ( warm white, green, red, blue, purple, orange and indigo ) lights according to your mood and adjust 10 relaxing brightness to reading and guiding you in the dark. ⏰Snooze Function: Simply touch the snooze button of the light alarm clock to gain an extra 5 minutes for you to be ready for getting up. Start your every day with a fully-prepared body and mind. ⏰User-Friendly: Multi-functional design with the easiest set up guide. Our alarm clock can be powered by 5V USB charger and adapter. Save your time for changing the batteries. View More In Electronic Alarm Clocks. If you have any questions about this product by WEIJI, contact us by completing and submitting the form below. If you are looking for a specif part number, please include it with your message.